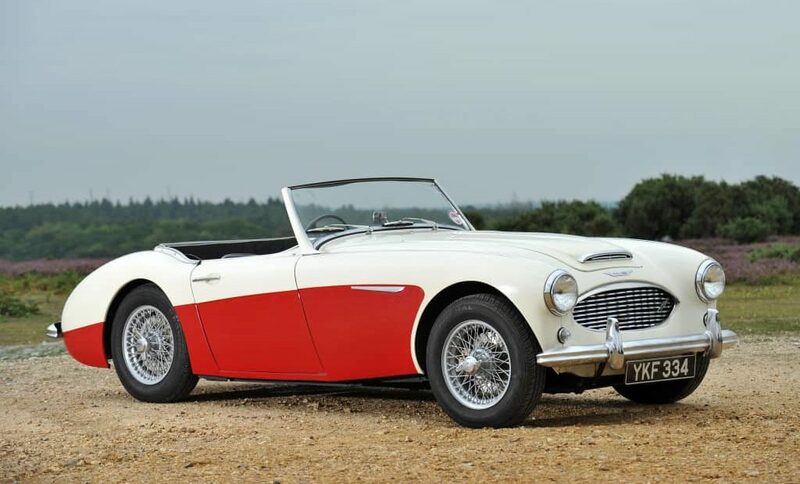 The Austin-Healey 100 was one of the best sports cars of its era and so successful that the two next models were heavily based on it, the last being the legendary Austin-Healey 3000. The car was roadster with two seats and an I4 engine with power ratings varying between 90 hp and 1312 hp. The body was very lightweight and the styling was sleek and to everyone’s liking at the time and even today the car has lots of classic flair. Time has not made it outdated in any way. The car was built like a proper sports car and this was evident wherever you look. The body was light and sleek, the interior was well-built, but devoid of heavy perks and the engine was capable. It was built from 1953 to 1956 and during that short period it received several different versions, one major facelift and numerous upgrades to everything from styling to mechanics an performance. The Austin-Healey 100 was the first joint effort of Donald Healey and Austin Motor Company, managed by Leonard Lord. The first step in this cooperation was Donald Healey’s development of the car and its presentation at the 1952 London Motor Show. This is where Leonard Lord saw the car and he was impressed, seeing this as a replacement for the A90 that was not all that successful. However, there was another reason why this was a good idea. The initial version of the Healey 100 was based on Austin A90 mechanics. The 100 in the name was there due to the car’s ability to reach 100 mph, which was a noteworthy achievement at the time. Despite lasting only from 1953 to 1956, the Austin-Healey 100 had several different versions and two generations. The first one of the 100 lot was dubbed BN1 and it featured the 2.7 I4 engine boasting 90 hp familiar from the A90. The gearbox was modified, though, and it was a three-speed manual with overdrive. The car was tested by The Motor magazine and they made it to 106 mph, accelerating from 0-60 mph in 11.2 seconds. The car was not only fast, but it featured cam and lever steering and independent front suspension with coil springs and a rigid axle with semi-elliptic leaf springs. The breaks were drums all around, but they were more than good enough for the lightweight car. The BN2 came in 1955 featuring several improvements, including a four-speed manual with overdrive on the top two gears. Another improvement was a different rear axle and a stylistic change of front wheel arches. The same year was the time when the 100M was introduced. It was a high-performance version of the car featuring numerous changes under the hood. The power rating boost came from using bigger carburetors, cold air box, different camshaft and 8.1:1 compression pistons. The result of all these was 110 hp, which was a significant increase. This is why the front suspension was also revised. The 100M was mostly painted two-tone. Interestingly, all of the engine improvement parts except the pistons could be ordered as the Le Mans Engine Modification Kit upping the power to 100 hp for both the BN1 and BN2 models. By the time the BN2 era came, the manufacturer was trying to make the car more appealing, offering it in numerous different colors: Carmine Red, Reno Red, Spruce Green, Florida Green, Healey Blue, Black, Old English White, Gunmetal Grey and two-tone paints including white/black, red/black and vice versa, blue/white and green white. 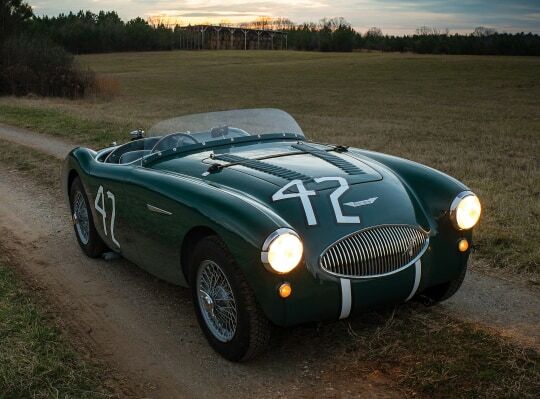 The 100S was a racing version of the Austin-Healey 100, built from aluminum and boasting 132 hp. It was a serious machine, featuring non-overdrive gearbox and aluminum cylinder head for reduced weight, as well as four disc brakes, which made it unique at the time – no other production car in the world had all four disc brakes. The weight of the 100S was further reduced using a smaller grille and removing bumpers and convertible top, as well as replacing the windscreen for a plastic one. One of the 100S was sold for more than $1.3 million in 2011. The car was driven by some of the most famous factory drivers and it took part in the 1955 Le Mans Disaster, which is the crash with the most deaths in motorsport. 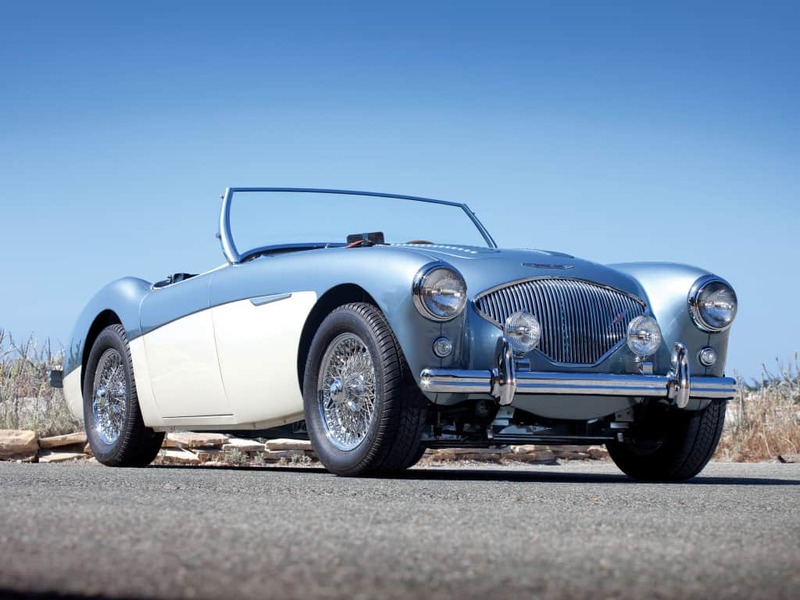 The Austin-Healey 100 was replaced by the 100-6 – a car that looked very similar but featuring longer wheelbase, fixed windshield and a completely new I6 engine. 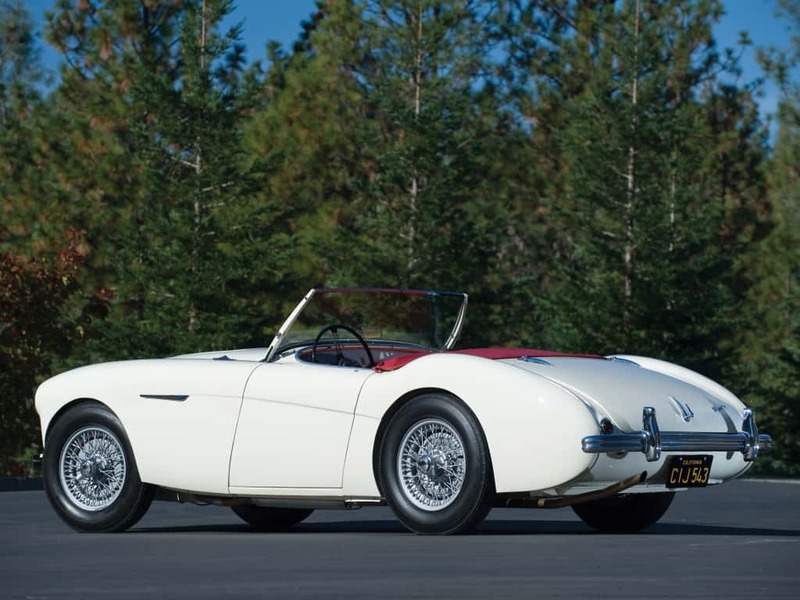 The Austin-Healey 100 was a fairly capable car even as a base model. The initial version was driven at 106 mph and it had only 90 hp. Later versions boasted more power – 100 hp with an optional performance kit, 110 hp for the second-generation version and 132 hp in the 100 S which was a racing car and lighter than the other versions. The lightweight body combined with FR layout was one of the biggest advantages of the car when it came to driving. Other perks included things like independent front suspension and great gearbox. The initial version had a three-speed transmission with overdrive, while the later one came with a four-speed gearbox with overdrive as well. The sporty 100 S had no overdrive as it was adding weight and pretty much useless on a racing car. The gearbox, regardless of the type, was one of the most interesting things in the 100. You can’t really compare it to the today’s gearboxes, but the gear changes were remarkably precise and even a bit harsh, which is great for driving enthusiasts. The brakes were also good, ranging from all drums in the initial BN1 model to all discs in the 100 S. Even the drums were more than sufficient, rarely having problems with fading, but discs in the 100 S were simply unbelievable, being more efficient and having to deal with a lighter car. It was a proper sports car. No superfluous additions to add weight, no huge comfort, no loose parts, no weak plastics… Inside you would find amazingly supportive leather seats that seemed completely immersed into the rest of the interior, which is great for a sports car. The steering wheel was a big, three-spoke one and behind it there were four dials, the rev and speedometer being bigger and closer to the steering wheel. The dashboard was curved in front of the passenger’s seat to give more room and that was about it. This being said, this was one of the most effective interiors for a sports car at the time. The driver’s position was amazing, the gear stick was very close to the steering wheel, which is great for sports driving and the driver would feel cocooned.